Does this fruit look like an apple? The red blush spread in the golden yellow hue may create such an optical illusion. But, it is more of a peach without fuzz on its skin. It is called Nectarine (meaning as sweet as nectar) or fittingly as “Shaved peach”. The most intriguing fact about it is that there is no separate nectarine tree. It is just a peach tree with genetic mutation. The same tree may bear both nectarines as well as peaches. A seed from a peach may grow to produce nectarines and vice versa!!! It is usually smaller (the hybrid one is as big as a peach), sweeter, has a pulp firmer and skin brighter than peach. 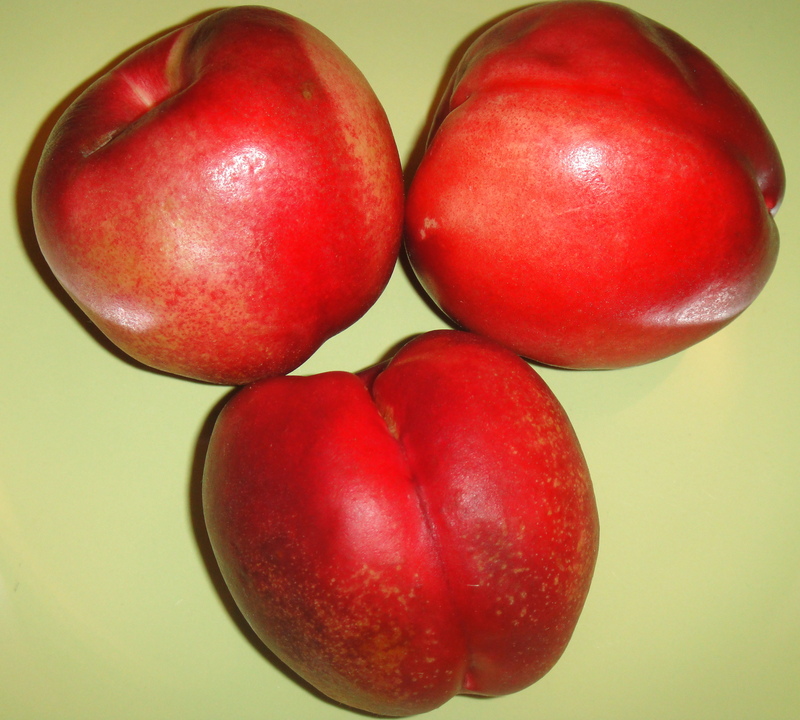 Unlike most fruits nectarine’s colour is not a determinant of its ripeness, but the texture and fragrance are. Its nutritional profile boasts of a high value of vitamin-A, beta-carotene, vitamin-C and potassium; nil sodium content; considerable amounts of fiber and protein. It is abundant in the phytochemical lutein, which is responsible for its colour. A study conducted on fruit flies showed that nectarine extracts promoted longevity in female flies by increasing the reproductive capacity, modulating glucose metabolism and by reducing oxidative damage. Though it is ambiguous if the results can be extended to human beings in totality, by virtue of its nutrients, nectarine offers us benefits like fostering healthy skin, maintaining colon function, boosting immune system, protecting against free radical damage and certain types of cancer. Warning about amygdalin in the seed, that gets converted to cyanide inside the human body is common. Nobody could possibly swallow the pit by mistake as it is big enough. I pondered if anybody would bother to crack open the nut to eat the seed? Even if they did so, how many seeds would be required to produce the lethal dose of cyanide (roughly 1.5 mg per kg body weight)? Were there any deaths reported due to the consumption of nectarine seeds? I just thought that this was much ado about nothing. This being on one side, there are controversies that amygdalin is nothing but vitamin B17 that has anti-neoplastic activity. The claim of amygdalin being panacea for pathological conditions is again regarded by many as marketing gimmicks of pharmaceutical companies. There is no concrete proof for all these proclamations. Nectarine is usually used in making jams, jellies, preserves, mixed fruit desserts, ice-creams, pies, cobblers and cakes. I was neither in the mood of cooking nor do I like to consume a fruit cooked, unless it is unpalatable otherwise. I usually prefer to eat any fruit as a whole or include it in salads. But guess the surfing for recipes had its impact on me. 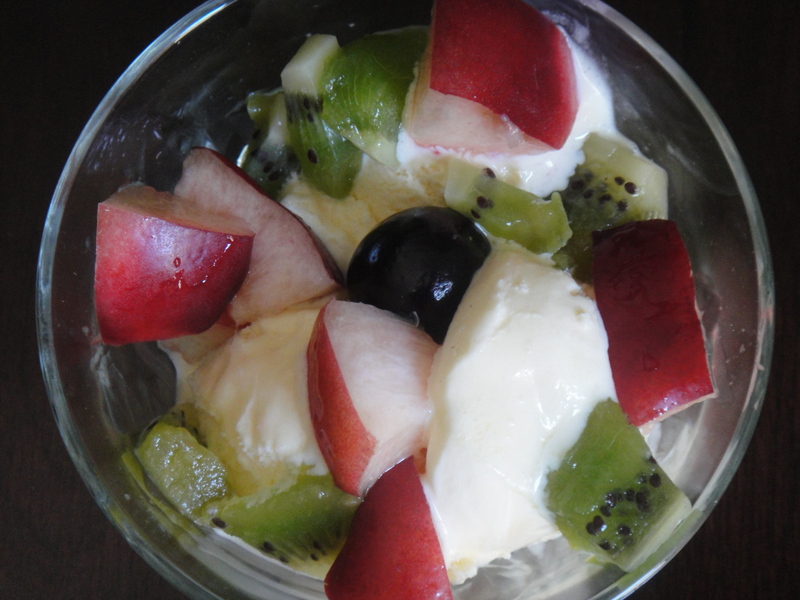 I mixed few pieces of nectarine, kiwi and a cherry with a dollop of vanilla ice-cream and merried my way through it. For those who are calorie conscious (avoid flipping through fat and sugar laden recipes before preparing any dish – you will be smitten by a desire to eat such foods), skip the ice-cream and retain the fruits or it would be even better to just bite through the nectarine and relish its taste and flavour in all its freshness. How Poisonous Are Peach Seeds? Posted in Fruits and tagged Amygdalin, Cyanide, Free radical damage, Glucose metabolism, Nectarine, Shaved Peach, Vitamin B17. Bookmark the permalink.